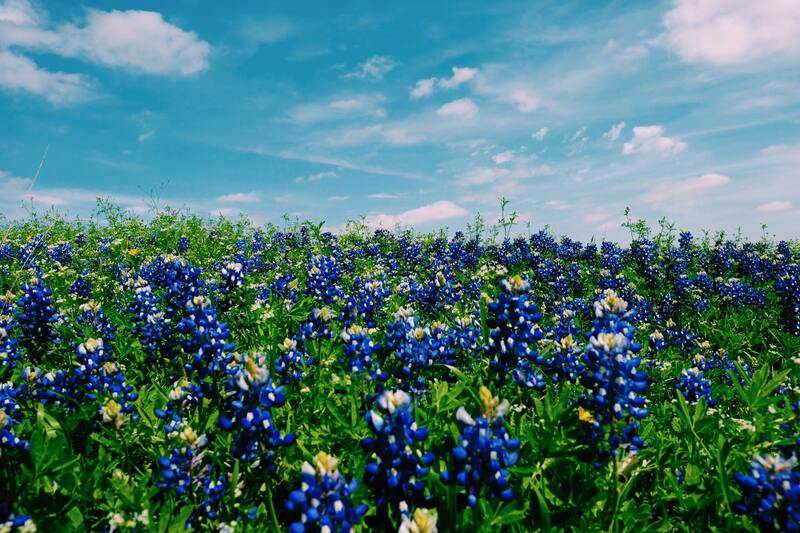 The 2019 Bluebonnet season is arriving, and some of the best places to see bluebonnets are near Fredericksburg in the Texas Hill Country. Due to the rainy fall and winter, Andrea DeLong-Amaya, director of horticulture at the Lady Bird Johnson Wildflower Center, predicts “a truly photo-worthy 2019 wildflower season.” (Gaskill, March 15, 2019). Jason Weingart, who ranks best locations for seeing bluebonnets every year, predicts: “The Hill Country looks to bounce back in a big way this year.” (Weingart, February 1, 2019). Popular bluebonnet locations such as the Willow City Loop and Wildseed Farms are only 15 – 30 minutes away from Wine Country Cottages in Fredericksburg. Suggestions for bluebonnet trails and scenic drives abound. As alternatives to the famous and sometimes crowded Willow City Loop, FredericksburgTexas-Online.com suggests four scenic loops from Fredericksburg that will “take your breath away.” All four include U.S. 87 toward Mason. One also includes Enchanted Rock and Llano, another loops through Castell, and one takes a northwestern route to Doss. To the east, U.S. 290 leads to Lyndon B. Johnson National Historical Park in Stonewall, just a 20 minute drive from Fredericksburg. Abundant wildflowers bloom around its visitor center, and a nature trail leads from there to the adjacent Sauer-Beckmann Living History Farm. Pedernales River Nature Park, 15 miles farther east on U.S. 290, offers hiking trails, mountain biking trails, and picnic areas from which to enjoy the display of bluebonnets and other wildflowers. Weingart, Gaskill, and others suggest a number of locations north from Fredericksburg, including Marble Falls, Highway 16 to Llano, and Highway 29 between Burnet (“Bluebonnet Capital of Texas”), Llano, and Mason. From Highway 29, roads lead to several parks with hiking and nature trails from which to enjoy bluebonnets and other wildflowers. To the north of Buchanan Dam is Canyon of the Eagles Nature Park, while to the south is Inks Lake State Park. The Texas Hill Country Bluebonnet Trail highlights scenic drives in the Highland Lakes around Horseshoe Bay, Granite Shoals, and Kingsland, plus Inks Lake, and Buchanan Dam. To learn more about bluebonnets and other Texas Hill Country wildflowers, visit the Lady Bird Johnson Wildflower Center website. While bluebonnets are the most famous, many different wildflowers bloom throughout the spring in the Hill Country. Indian Paintbrush, Pink Evening Primrose, Mexican Poppies, Coreopsis, and Winecups are just a few. Spring is a special season here, so don’t wait to make plans for a Hill Country getaway. Each of our Fredericksburg cottages is unique – just go online and reserve your favorite! 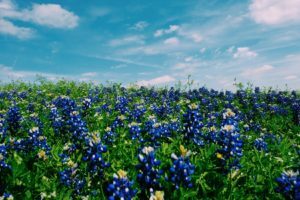 This entry was posted in Events, General, Outdoor activities, Uncategorized and tagged 2019 Texas Bluebonnets, Bluebonnet Trail, Bluebonnets near Fredericksburg Texas, Texas Hill Country Bluebonnets, Willow City Loop by admin. Bookmark the permalink.